Fall Chicken From Little Peace Farm! Posted 7/17/2018 5:53am by Michael Scheidel. *Chicken must be pre-ordered! To pre-order, reply to this e-mail with the following information: how many birds you would like; would you like them whole or parted out (refer to fee below); would you like them vacuum sealed (refer to fee below) or just on ice to transfer to your cooler at pick up? We are requesting a $5 deposit per bird ordered due as soon as possible. If you respond to this e-mail with your order, we will put you on the list right away to reserve your chickens. Checks can be made to Little Peace Farm 257 Moon Hill Dr. Schuylkill Haven, PA 17972. Please refer to the details below about pricing and options. Posted 6/12/2018 11:11am by Michael Scheidel. Week two for our 2018 CSA! If you order online and forgot to order this week, DON'T WORRY. You will still get a "farmer's choice" share this week. Farm pick up today from 4-6 and Saturday from 9-12. Woo drop off tomorrow after 10, pick up at the Hershey Farmer's Market 2:30-6:30 Thursday, and Healthy Habit's pick up Friday after 10. Remember that the first two weeks or so of CSA includes a LOT of greens but that is about to change next week. Here's what you can expect to see next week: broccoli, beets, basil, bouquets, peas, spring onions and more. Stay tuned for more farm news! Eat, smile, and repeat for next meal! Even if you over cook it, it's absolutely delicious. Weather certainly has been a challenge but overall, we're doing ok. All heirloom tomatoes are planted, staked and trellised in the high tunnel as are cucumbers. Sweet and hot peppers and eggplant are out in the field, sweet corn is really greening up, and potatoes look great. Hope you are all enjoying the early summer! Plant Sale This Weekend and More Farm News! Posted 5/8/2018 4:33pm by Michael Scheidel. Come out this Saturday, May 12th to celebrate Mother's Day AND the beginning of a great growing season! Our Annual Heirloom Tomato and Plant Sale (9-1) is a great time to get some healthy plants for your garden of for mom. We grow over 30 varieties of heirloom tomatoes and have lots of other plants available like: head lettuce, kale, chard, flowers, herbs, peppers, and more. I posted on FB it was 10-1 but if you want to come early, we will be open by 9. If you pre-ordered pastured chicken, the process has begun! We received 400 broiler chicks over a week ago and have been keeping them warm in our brooder. Weather dependent, they will go out of fresh grass by the end of next week. The processing date is going to be the third week in June. If you didn't order this round, no worries, we grow a fall batch as well. We still have CSA shares available for the 2018 season. You choose what you get each week for 20 weeks! Check out details on our website. We have been working like crazy to take advantage of the great weather and have gotten a lot of ground planted or ready to plant. We're hopeful for a great season. Care Net, Crops and More Farm News! Posted 4/25/2018 8:47am by Michael Scheidel. We are looking for sponsors for our kids for the Care Net of Schuylkill County 5K run next weekend. Lots of you know our kids are runners whether they're old enough to be on a team or not, they run ALL DAY on the farm AND in the house! So what this would require from you would be a response to this e-mail with your full name, address, phone/e-mail and your pledge amount. YOU DON'T HAVE TO SEND US ANY MONEY, Care Net will get in touch with you after the race. We greatly appreciate the support of our kids and especially the young moms who need the loving services provided by Care Net. We have been working like crazy getting ground ready, and either direct seeding or transplanting all of our early season crops. I had to cut the day short yesterday, trying to get seed in the ground before heading to a fundraising charity dinner in Reading and before the rain came. It was a sprint but I got it done. Here's what we have in the ground: carrots, beets, radish and turnip, cabbage, Napa cabbage, pac choi, broccoli, romanesco, head lettuce, arugula, tatsoi, broccoli raab, peas, onions, garlic, kale, and a few more goodies I'm forgetting. Our nurseries are full of plants getting ready for the garden and our Annual Mother's Day Heirloom Tomato and Plant Sale on May 12th. If you are a gardener looking for plants, get in touch with via e-mail as I have lettuce, kale, potatoes, onions, swiss chard and more ready to be planted! Posted 4/10/2018 1:22pm by Michael Scheidel. Just wanted to thank those who pre-ordered chicken. We are sold out. If you missed ordering this round, no worries, we raise a second batch that will be ready in October. Stay tuned for more news. Gratefully Growing! Posted 4/3/2018 4:02pm by Michael Scheidel. This time of year is always hard on our farm for a few reasons. #1. Aesthetics. The trees are still bare, the fields haven't greened up yet and everything that isn't wakening from winter dormancy is MUD! #2. Planting. The nurseries are full of plants waiting to be transplanted into the fields but the conditions are way too wet to trample the soil. Needless to say the weather has not cooperated for early spring planting so far and the extended forecast doesn't look promising! #3. Animals. Our livestock are happy. 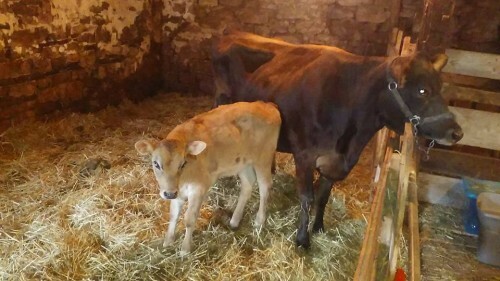 Ruby, our family milker, and her calf rule the barnyard and some of the barn. The three steer the children are raising are in their stalls filled with warm straw bedding. However, I know they would be even happier if they had some green grass to graze on a sunny hillside! Thank you to all who have ordered our pastured chicken for June. We have plenty of birds still available for purchase so if you are interested check out pricing and details in previous post on our website blog. We have plenty of CSA shares available for the all-too-slowly-coming growing season! If you are looking for some great fresh, local and thoughtfully grown food, consider joining our CSA. All details are on our website under the CSA/Ordering tab. As always, e-mail if you have any questions. We are constantly evolving to make our farm a fit instrument for change in our lives and in the lives of our community of supporters. Here are some changes to look forward to for this season...extended market hours on the farm, more volunteer opportunities, pot luck dinners again, and a greater variety of produce. Stay tuned for more details. Posted 3/27/2018 8:32am by Michael Scheidel. It's been a loooooong winter but it looks like spring is sloooooowly wakening! I have not been able to get into the fields at all but am focusing on the high tunnels and working in the nurseries. Each year, we raise organically fed/pastured broiler chickens from day-old chicks. If you have tasted these birds before, you know the difference between them and store bought, confinement chicken. No comparison! If you haven't tried a pasture raised chicken, this could be your chance! *Our first round of chicken will be ready for pick up on June 22. We are requesting a $5 deposit per bird ordered due as soon as possible. If you respond to this e-mail with your order, we will put you on the list right away to reserve your chickens. Checks can be made to Little Peace Farm 257 Moon Hill Dr. Schuylkill Haven, PA 17972. Please refer to the details below (same as last year) about pricing and options. Very grateful for your support of our small diversified ecological farm. Also, we are accepting CSA members for the 2018 season! If you haven't already and are interested, now is a good time to join! Please share and spread the word! See our website for details or send an e-mail. Gratefully. 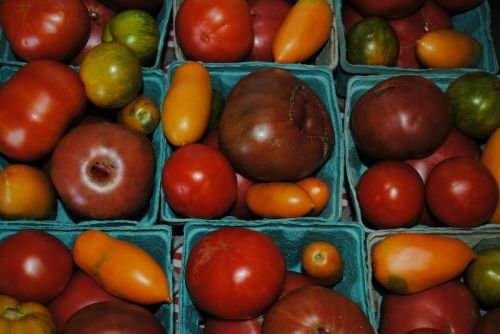 Pastured Chicken, CSA, Heirloom Tomato and Plant Sale and more Farm News! Posted 3/16/2018 9:47am by Michael Scheidel. Despite the unrelenting cold, wind and snowy weather, we are prepping for a great season. The current weather is driving us nuts but we all know it'll break soon (just trying to stay positive!). Our nursery is filling up with starts like pac-choi, napa cabbage, broccoli, cauliflower, kohlrabi, beets, head lettuce, and peas. We've also got our heirloom tomatoes seeded as well as a growing lineup of peppers. Flowers have popped up and will soon be ready for bumping up to flats where they will grow out to be planted in the field. We are looking to really expand our culinary herb selection this year too so keep an eye out for some really awesome herb varieties! Nest week we will be taking pre-orders for our pastured chicken for the 2018 season. 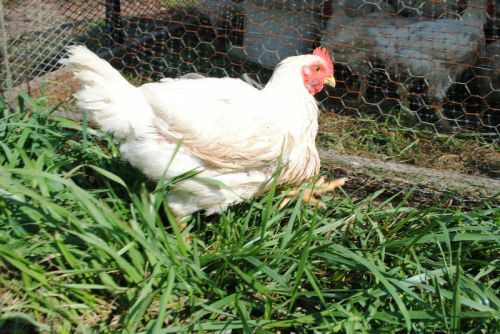 We raise two batches of pastured/transitional organically fed broiler chickens on our farm. Our first batch will be ready by mid-June. So stay tuned for our e-mail next week regarding pre-ordering. We will again be offering whole birds or the whole bird parted out. We are accepting new members for our 2018 CSA. To not be redundant, all details and pricing are on our website under the CSA/Ordering tab. We offer "your choice" full shares (10 items/week), half shares (6 items/week) as well as add on flower and herb shares. Currently pick up locations are here at the farm, at Healthy Habits Natural Market in Orwigsburg, Woo de La Kitchen in Hershey and at the Hershey Farmer's Market. If you own or work at a business that is interested in hosting our CSA for your employees or coworkers, get in touch! Easy online payment available too. We would love to grow for you! Mother's day is tomorrow!!! Just checking to see who is still reading! Actually it's May 13th and we are having our annual heirloom tomato and plant sale on the 12th. We feature some awesome heirloom tomato varieties as well as peppers, flowers, herbs and other garden plants. Mark you calendars and stay tuned for more plant sale news! Mud, Conference, and CSA Day! Posted 2/19/2018 8:09pm by Michael Scheidel. These kind of days are the toughest for me as a farmer; plenty to do but nothing seemingly meaningful. Super muddy, cows stuck in the barnyard, kids stuck in the house. I know seed ordering, crop planning, book keeping, marketing and repairs are all important but sometimes, as I often joke with my brother Frank, "This sure doesn't feel like farming!". I recently attended PASA's annual Farming for the Future conference in State College and although I wasn't excited about all of the workshops or speakers this year, as always I came home with ideas and energy to start the season. It is always great to catch up with some great farmers who are bearing the yoke as well. The biggest take-away for me this year was the message to take care of yourself and family if you want to keep on farming! In the past we have offered our CSA to companies who want their employees to eat healthier and have easy access to fresh, honest food. Employees sign up, boxes are custom ordered, packed and delivered to the business each week. If you or someone you know owns a business and is looking to host a CSA drop for their employees, we just might be the farm you are looking for! Please share this message! Send us an e-mail through our website if you would like to inquire further. This Friday, February 23rd is National CSA Day, an effort in the slow food movement to motivate folks to support their local farmer and sign up for a CSA share. So...now is a great time to get in touch and join our CSA for the 2018 growing season. You can join and pay online to! All details can be found on our website under the CSA tab. Share with a friend! Calf, Calves, and Last Chance for Discount! Posted 1/13/2018 8:54am by Michael Scheidel. What a ride this winter season has been so far. Not that I need to remind anyone but...record early freeze in early November, record stretch of cold mid Dec. through early Jan., record warm yesterday and down to 8 (!!!!!!) tonight! Lots of record breakers so far. The cold has brought some challenges to the farm but I look at it as a blessing for someone who farms without spraying fungicides or synthetic pesticides; the cold temps kill off lots of disease and larva that would survive a mild winter. That means hopefully less disease and pest pressure in the spring and summer. At the end of November we welcomed Scarlet to our farm. This was the second calf for Ruby, our milker, and she had a real hard time birthing her. The night was barely in the double digits and the kids had finally given up seeing the birth and went to bed so just Emily and I were in the barn waiting and watching. Finally, after hours of real stressful and unproductive labor, I decided that I had to pull the calf, which we thought had died. Well, that wet plop of fur hit the straw and after several seemingly endless seconds gave it's first wiggle, a sign of life. Emily and I were shocked she made it and were high five-ing and hugging and crying (ahem...only Em) that what one moment seemed a hopeless situation turned into one of complete Joy and relief. Three of our children are treading some new territory this year in deciding to raise Holstein dairy beef calves for 4H. 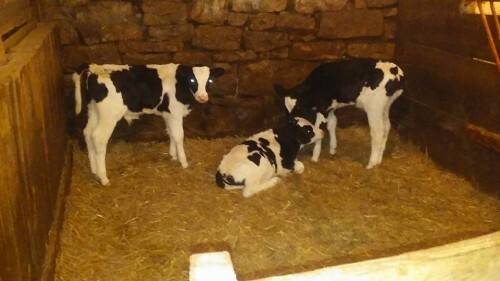 The days-old calves were delivered to us this week and very quickly got accustomed to their new digs! We are foregoing milk from our cow for about a month and feeding the milk to these three. We think that instead of artificial milk replacer, we would start them out with the best that they can get; mother's milk! Early Bird Discount Almost Over! We are offering our CSA shares for 2018 at a discounted rate only until January 15th. See our previous post for all the details and take advantage of a great deal!